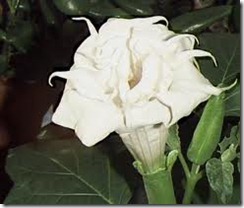 Angel trumpet is the common name for a genus, Brugmansia, of small trees and shrubs that are native to South America. Long, hanging, trumpet-shaped flowers give the plant its name, and their fragrance gives them a spot in many gardens. Angel trumpet is easy to grow in U.S. Department of Agriculture hardiness zones 10 to 12, as long as it is given lots of water and full sun. Lay a coffee filter in the strainer and add your potting soil. Pour boiling water over the soil. Allow it to drain and cool. Pour the potting soil into the planting pot. Lay the seeds on top of the soil. Sprinkle 1/4 inch of soil over them. Lightly mist the soil covering the seeds, using the plant misting bottle filled with water. Place the pot in a warm, bright area, out of direct sun. Keep the soil moist, but not soggy. Your angel trumpet seeds should germinate within one month. All parts of the angel trumpet plant are poisonous.